In 1967, Larry Russwurm was born in high tech Waterloo, Canada. His family quickly moved to an area of rural Ontario known for its technology-rejecting old order mennonites. His was a fine arts family, with musicians, artists and writers counted among his siblings, parents, uncles, aunts and even cousins. But this didn’t stop young Russwurm from becoming good at mathematics which eventually led to him rebelling against low tech and the fine arts and pursuing a physics degree at York University in Toronto. He had to pull out of the physics program 1 1/2 courses from graduation due to the onset of mental illness. He never returned. Russwurm has had many odd jobs over the years. These jobs have ranged from filling house in a mushroom farm (guess what mushrooms grow in) to helping out at the York observatory for Public Viewing to making political cartoons for the Lexicon (also at York). He writes sensawunda science fiction and has long been a fan of this sub genre. From Heinlein’s waldos to Niven’s Ringworld to Asimov’s Foundation Series, sensawunda seems best to Russwurm if it is far future fiction that uses logical rigour even though the technology is likely far away. 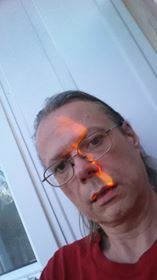 In 2009, Russwurm began his humour blog at larryrusswurm.com – The Many Rants of Larry Russwurm. More recently he started a blog entitled “Nooz Spun Right”. He is currently working on his five book long series, The Fabricated Series. The first book will be called Fabrications. Like classic series before his, this series will be made up of short stories, novellas, and novels.